A USB 2.0 interface with 8 amazing D-Pres, high-quality conversion, and DSP FX, including REV-X Reverb and 8 channels of Morphing Compressor. 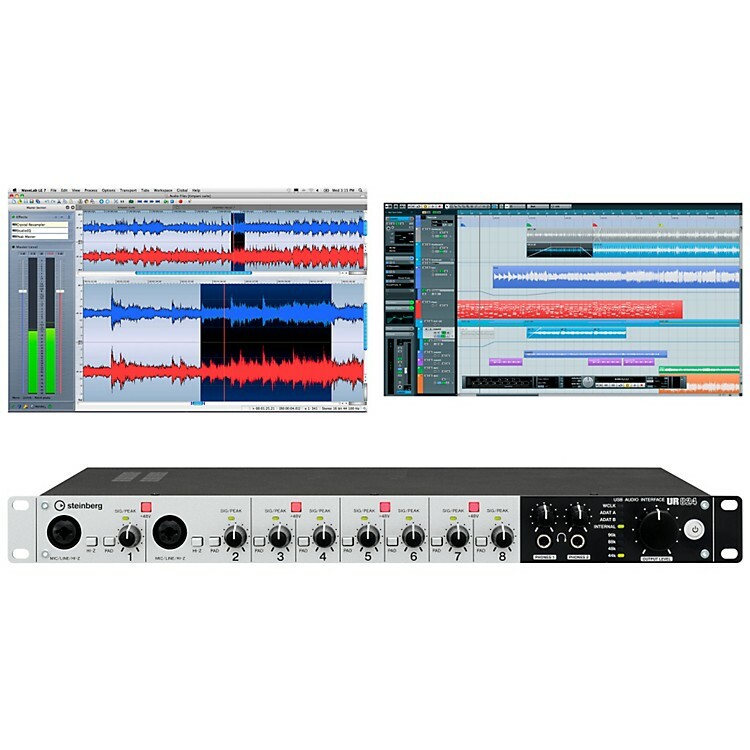 The Steinberg UR824 is a 1U, 19-inch audio interface that fits nicely in your studio rack. Its high-speed USB 2.0 lets you connect to your PC and Mac computer while the two pairs of ADAT I/O, eight Neutrik combo inputs with state-of-the-art D-Pre mic preamps and eight TRS outputs add up to 24 channels, providing ample ways to hook up all your musical gear and connect even to 7.1 surround setups. Its DSP-powered dspMixFx technology boasts latency-free monitoring in conjunction with the REV-X reverb and Sweet Sport Morphing Channel Strip effects. The UR824's front panel hosts two Neutrik combo TRS/XLR connectors for balanced microphone/line input with switchable 48 volt phantom power and Hi-Z, pad push buttons for signal attenuation, gain controls with peak indicators. On the opposite side there's a single output level rotary knob that allows you to easily adjust the levels of the eight line output signals alongside two headphone connectors, each with a dedicated level control. The output signal to be controlled by the front panel rotary is selected through the software. The rear panel provides six Neutrik combo TRS/XLR inputs and eight analog balanced TRS outputs as well as two pairs of optical ADAT inputs and outputs. Also on board are two BNC connectors for -switchable word clock input and output. Developed by using advanced technologies to offer seamless scalability, this mixing and recording interface offers options to expand the number of analog inputs and outputs across the system via ADAT to provide up to 24 input and output channels. For signal synchronization, the UR824 interface also features JetPLL, a patent-applied solution for audio network jitter. JetPLL provides the same performance as traditional, expensive clocking solutions found in the world's best professional clocking products. With its expanded I/O capabilities, the UR824 interface lets you hook up a vast number of equipment and instruments, the signals of which can also be fed via its high-speed USB 2.0 link to your computer for mixing and recording at a maximum audio resolution of 24-bit/96kHz. Cubase AI 6 is a lean Cubase version tailored to record your music without additional bells and whistles. Based on the same core technologies as Steinberg's highly acclaimed Cubase 6 advanced music production system, Cubase AI 6 offers a comprehensive feature set for composing, recording, editing and mixing. Run it with the UR824 and Cubase AI 6 provides a full system solution for recording music in studio quality, used by many musicians and producers around the world. Cubase AI 6 uses the same professional audio and mixing engine as Cubase 6. With a resolution of up to 24-bit and 96 kHz, as well as 32-bit floating point internal processing, Cubase AI 6 delivers fantastic sound quality even to the home studio. Cubase AI 6 is ready even for demanding songwriting and production projects. Offering up to 32 audio tracks, up to 48 MIDI tracks to control external instruments, as well as up to 16 instrument tracks and 8 slots in the VST Instrument rack to control virtual instruments, Cubase AI 6 has enough power to suit the needs of discerning musicians and records as many as 16 audio channels simultaneously. The easy-to-use Key, Score and Drum Editors included in Cubase AI 6 help in getting the job done quickly without blocking the creative process when writing or producing a song. Cubase AI 6 also includes support for Steinberg's realtime audio time-stretching and pitchshifting technology called "AudioWarp", allowing audio files to be played at a tempo or in a key different from the original file without any offline processing. AudioWarp also supports ACID files, making it compatible to hundreds of loop and sound libraries available. Cubase AI 6's powerful audio editing functions include a state-of-the-art transient detection, which is particularly useful for slicing and manipulating drum or percussion loops. Cubase AI 6 not only features powerful recording and editing tools, it also includes a complete set of great-sounding VST3 effects plug-ins covering a wide range of types, including EQ, filter, dynamics, modulation, reverb and delay. The included HALion Sonic SE workstation instrument features 180 ready-to-play instrument sounds and full GM compatibility which makes a great starting point for any composition. Instruments include pianos, basses, drums, synths, brass, strings, and many more. The mixer section in Cubase AI 6 offers everything musicians need to create professional-quality mixes with sample-accurate timing and full plug-in latency compensation across the entire signal-path. With up to four insert effect slots and four effect sends and returns as well as 8 group channels, this powerful virtual mixer offers a lot of flexibility. The 4-band fully parametric EQ features exact control of any signals frequency-response. Every knob or function can be automated. In addition to the included plug-ins and instruments, Cubase AI 6 is compatible with hundreds of additional virtual instruments and effects available for the VST platform today. Cubase AI 6 is available both for Windows 7 and Mac OS X 10.6 (Intel only) and is delivered on both platforms as 32-bit as well as native 64-bit application. The UR series offers recording and production solutions for ambitious musicians and professional engineers alike. Connections required for studios such as word clock, S/PDIF and ADAT plus a range of Neutrik combo connectors on the UR824 and routable TRS I/O on the UR28M (#H77573) are at hand. Also on board are EQ and compression tools in the form of the Sweet Spot Morphing Channel Strips on each channel, not to forget the REV-X plug-in that provides quality reverb for modifying the intricacy of a sonic space. The UR824's eight line outputs offer full support for surround productions up to 7.1, while the UR28M (#H77573) allows for up to 5.1 surround with its six line outputs. The audio quality of the UR interfaces is absolutely stunning due to its state-of-the art convertors and studio-grade preamps. The UR824 features eight of the latest generation of Yamaha microphone D-Pre preamps while the UR28M (#H77573) comes with two D-Pres. Each discrete Class-A analog mic preamp utilizes an advanced Inverted Darlington circuit design and boasts a -26 dB Pad selector as well as 48 volt phantom power. The result is a sumptuously smooth and richly detailed sound normally only attained by preamps costing many times more; the outstanding sound of these mic pres obviate the need for all but the rarest vintage preamps. Just as important as the preamps are, of course, the converters behind them. The UR824 includes first-rate A/D and D/A converters that offer absolutely crystal-clear sound that portrays the sound with astonishing precision and clarity. To unleash the full potential of each UR interface, you needn't employ Cubase as the DAW of choice, but there are undoubtedly certain benefits that remain unrevealed to non-Cubase users. That's why a streamlined version of the award-winning Cubase music production system is included with both the UR824 and UR28M (#H77573). Combining the UR series with Cubase offers advantages such as full integration into the Cubase user interface for a smooth workflow. But there are plenty of reasons to take a closer look at the UR824 and UR28M (H77573) no matter what DAW you're on. Included are ASIO and CoreAudio drivers for full compatibility with any DAW application using either of these driver standards. The dspMixFx DSP mixer runs on Mac and PC and handles all aspects of DSP, routing, monitor mixing in one easy-to-navigate interface. A high-resolution, crystal-clear DAW solution that a professional could feel comfortable making an entire record with. Order today!